If you’re looking for a stress relieving winter pastime, hiking in the midst of forests and valleys blanketed in snow will leave you feeling serene. Nothing compares to the quiet beauty of a wintry panorama. 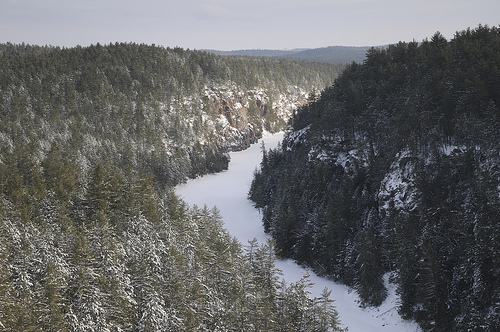 Winter hiking offers a unique experience of Ontario’s natural parks. There are no insects to worry about, there are striking views, and the parks are less populated, providing peace and quiet. 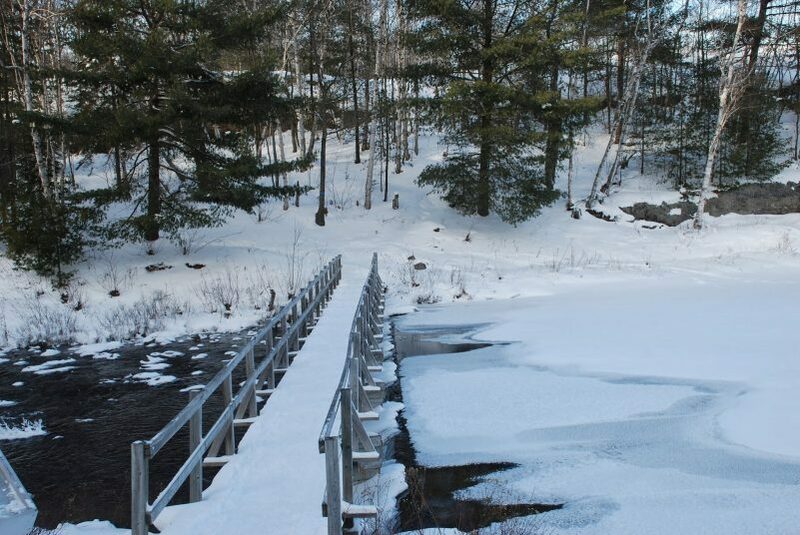 Here are some of the best winter hiking trails in Ontario. Rattlesnake Point near Milton is a gem that is not far from the city of Toronto. It offers 13 kilometers of trails and scenic views of the countryside from the top of bouldered cliffs. This area is home to thousand-year-old cedars, sheer cliffs, caves, glacial deposits and cute Chickadees that can be fed by hand. Winter days are the best time to spot snowy owls along the Niagara Escarpment because they are diurnal; they are active during the day as well as at night. Stunning winter views as seen from one of Rattlesnake Point’s lookouts. For shorter walks, Rabbit Run Trail and the Vista Adventure trail are both hiked in under an hour. Take the lengthier Buffalo Crag trail to follow the edge of the escarpment and see all of the lookout points. 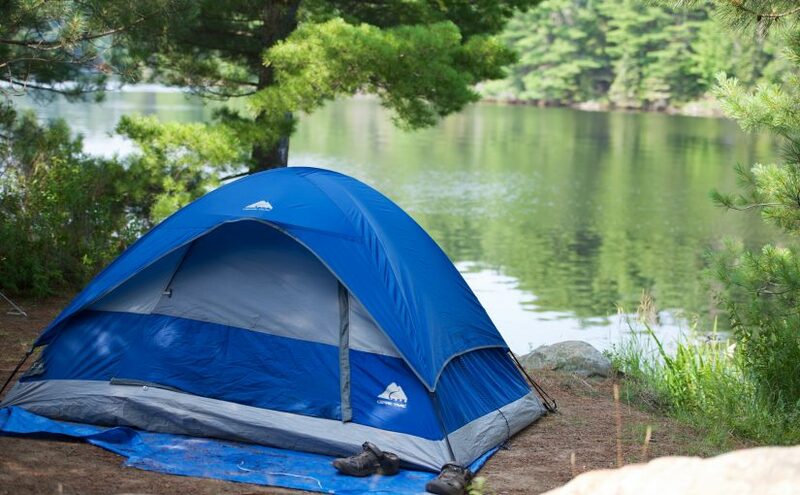 It offers breathtaking views of the valley between Rattlesnake Point and Crawford Lake. Be careful of stepping too close to the edges as they may be slippery during winter. 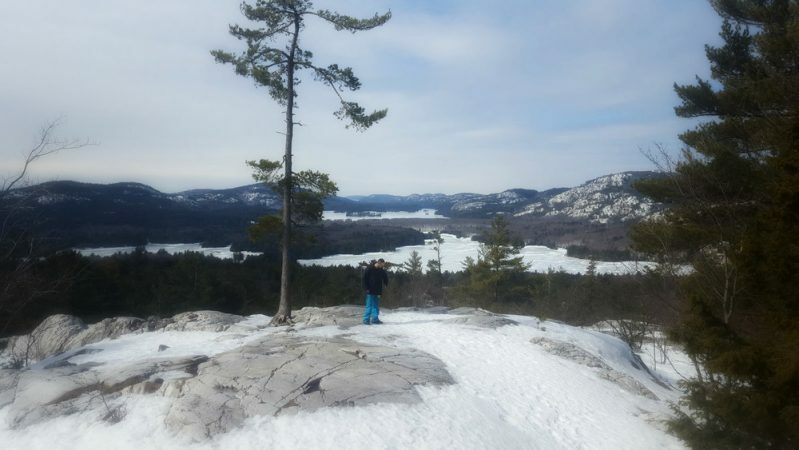 For more of a challenge, the Nassagaweya Trail is a 7.2 kilometre hike (one way) through forested areas from Rattlesnake Point to Crawford Lake. 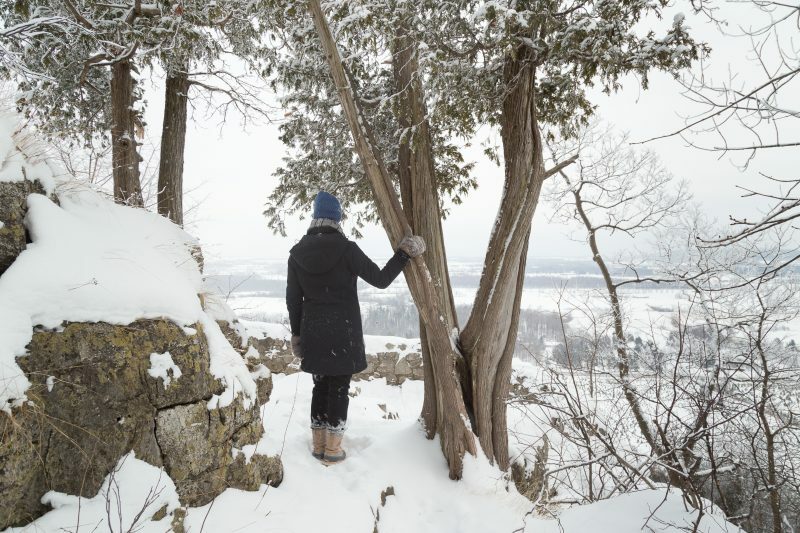 No matter the trail picked, Rattlesnake Point offers a view of winter landscapes from what feels like the top of the world. The Crack is a 6 km (there and back) winter hike that is not to be missed. To get the most of it, pick a clear sunny day and ensure that you calculate extra time as the snow and ice on this trail can slow you down. Snowshoes, micro-spikes or a winter trek pole are beneficial here for the steep areas and the icy, exposed rock. After you’ve passed Kakakise Lake and have crossed a bridge, the trail gains elevation quickly until you’ve reached “The Crack”, a deep chasm encompassed by tall rock walls. Once you’ve reached the top of The Crack, you will be in awe at the beauty of the winter panorama surrounding you. View from the top of “The Crack”. Photo by Northern Scavenger. The Scenic Caves Nordic Centre is a magical winter park at the highest point of the Niagara Escarpment and is in one of Canada’s UNESCO biosphere reserves. Its main features are a suspension bridge with sweeping views of Georgian Bay, and various trails that are both gentle and steep. 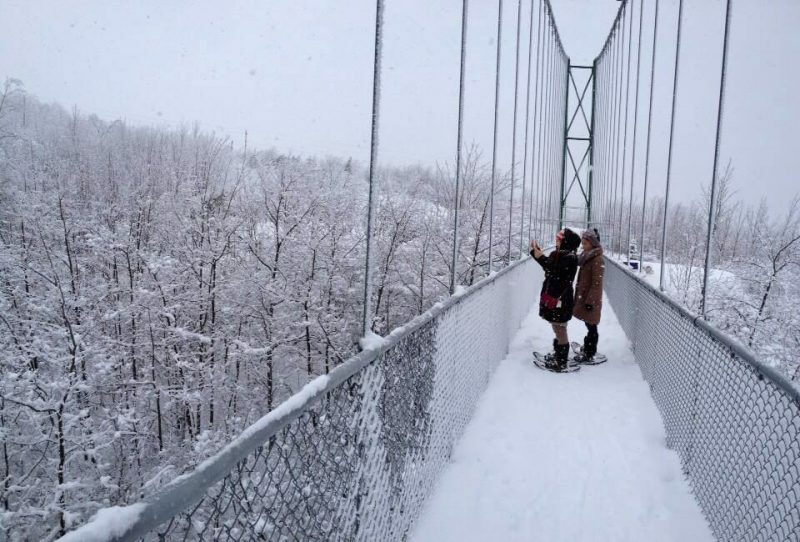 It has 27 kilometers of groomed cross-country ski trails, 10 kilometers of snowshoe trails that wind through a 200-year-old forest (one that crosses the suspension bridge with the panoramic view) and winter amenities such as a warm chalet, food and drinks sold at the snack bar and change rooms. The centre has guided night snowshoe hikes that illustrate winter’s beauty at its most otherworldly time. Snowshoes and cross-country equipment can be rented there as well. The Nordic Centre is open seven days a week, from early December to the end of March, from 9 am to 5 pm. Please be advised that there are high altitude conditions, and no pets are allowed in the park. 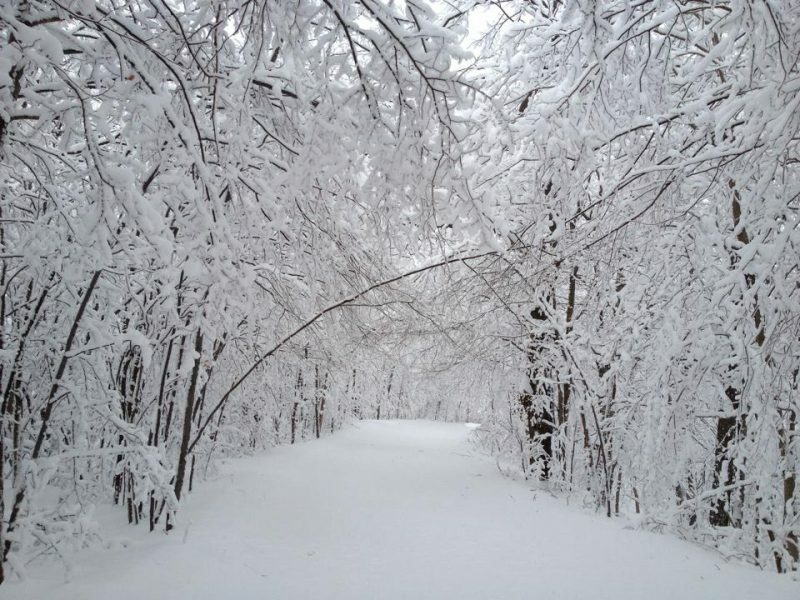 A trail at the Scenic Caves Nordic Centre. Tews Falls and Dundas Peak are part of the Spencer Gorge Conservation Area, which is also home to Webster’s Falls. 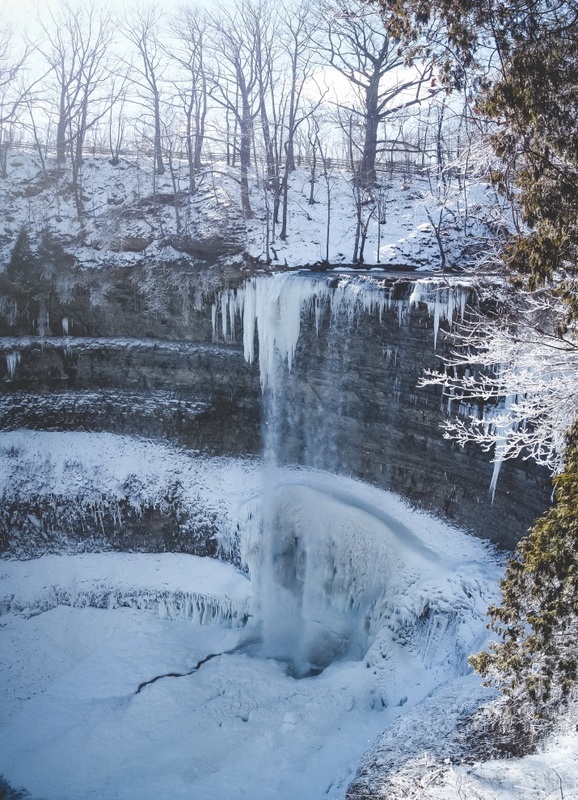 Tews Falls is a 41-metre ribbon waterfall that looks majestic in winter with parts of the falls being frozen and some ribbons of water still drizzling down the “bowl”. If you continue past Tews Falls on the trail you will reach Dundas Peak, which has impressive views of the winter gorge below. The drawback to this hike is that there is now a $5 fee per person, and a $10 fee for parking due to the fact that this natural park has become increasingly popular. Children 5 and under are free. Tews Falls. Photograph from Synthetica.ca. 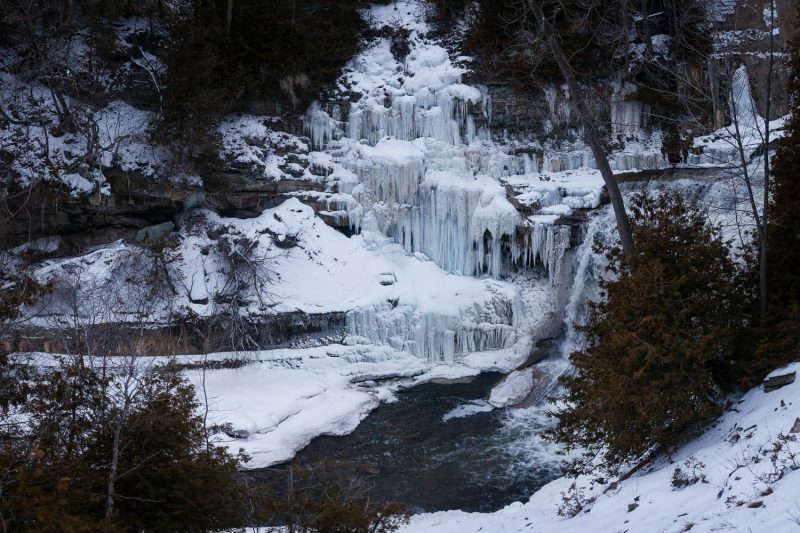 The Forks of the Credit and Cataract Falls Trail offers a pleasant walk through a snowy valley that passes Kettle Lake with large, age-old trees, down a steep forest path which leads to an icy, rushing Credit River. It rewards you with the breathtaking frozen Cataract and Falls, surrounded by rocks and pine trees. This was once an industrial complex in 1899, and the timeworn ruins are a unique contrast to the wild winter trails. You might even spot some wildlife tracks in the snow. This is truly a secret treasure for hikers, as there are not too many park-goers here. Be sure to dress warm and to bring flashlights, as the days are shorter in winter. Forks of the Credit Provincial Park. Photograph by Benedikt Langens. 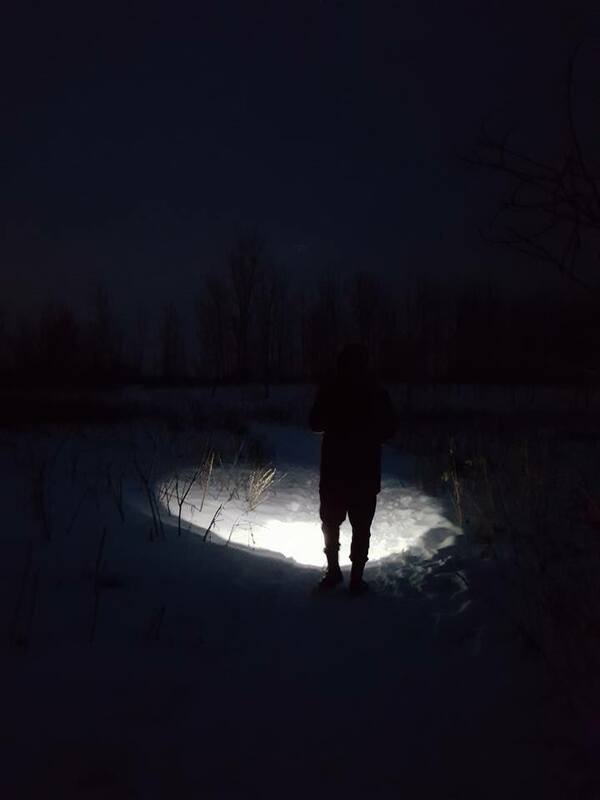 Kettle Lake at night in winter, Forks of the Credit Provincial Park. Photograph by Deanna Molnar. 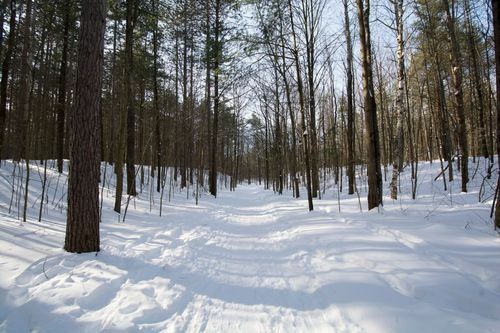 Glen Major Forest and Walker Woods is located in Uxbridge and contains 47 kilometres of trails – hikers, cross-country skiers, horseback riders and cyclists are all welcome. It contains a variety of ecosystems such as upland hardwood forests, conifer swamps and prairie-like areas, with species such as white-tailed deer, porcupine, coyote and red-shouldered hawk. Hikers can take the Glen Major Resource Tract, the Wilder Woods Tract or the Aggregate Trail. The Barron Canyon Hiking Trail runs along the north rim of the daring 100 m deep Barron Canyon. The trail is in the northeast area of Algonquin Park, which features rugged conifers and exposed rock cliffs that bear a resemblance to regions of the Northern Canadian shield. Keep in mind that this trail goes along an unfenced cliff, so please keep children away and pets on leashes. Barron River photographed from Barron Canyon. By David Sullivan. Although winter hiking has its charm, be aware that it also has particular risks. Follow these basic winter safety tips to have a safe and enjoyable experience. Wear insulating layers that can be put on, removed or adjusted to keep you warm or cool and dry, depending on your comfort. Lightweight and waterproof layers are the best option for a winter hike. Winter hiking boots should be warm, waterproof, with a good tread for slippery conditions and with enough room at the toes for thick socks. Hiking in the cold burns more calories, so ensure that you bring extra snacks and maybe even a thermos of a hot drink. Calorie dense foods such as nuts and chocolate are suggested. Nightfall arrives earlier, so be prepared with a flashlight in case. Dehydration is more common because we don’t feel as thirsty when it’s cold. Drink plenty of water or a warm drink. Be prepared for changing weather conditions.